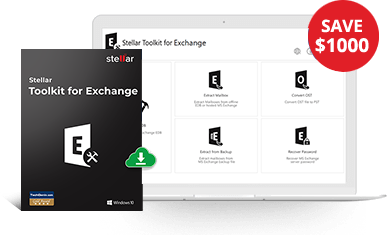 Stellar Exchange Server Backup can also restore the backed up data along with various option to increase the efficiency of the task. This specific part is to avail you the option to restore complete mailbox in one go. It restores the whole information of your backup along with name of selected Mailbox Store, range of the transaction log files and time. Further, the tool facilitates you to choose the incremental backup according to restore point (by date and time) from where you want to restore the Exchange Mailbox store. The Recreate User Option recreates those deleted or nonexistent user accounts and mailboxes that no more exist in the current Exchange server, but available in the backup. Enter the default passwords provided by Exchange Server and recreate deleted user accounts and mailboxes. Further the tool avails you two more options to restore backup data. First is Restore upto Selected point that moves all the Storage Groups and the Mailbox Store to a different location. The other is 'Restore up to the point of failure (no loss of data)' that restores data just before failure point without data loss. This option is capable of restoring selective items from your backup files directly to the original location on the live exchange server or in different location as PST, MSG or EML file format. Here, you can select the whole mailbox to restore or choose single or multiple mail items manually to restore from a tree like structured list. Manual restoration is another important feature of the software that restores the complete mailbox and individual mails as per your needs from an already existing Storage Group/Mailbox Store backup image. This process is like normal restoration operation, but needs an external MS Exchange database backup image. * free for first 90 days!